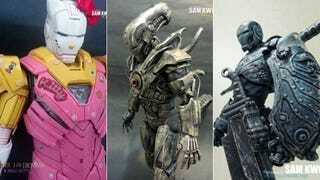 Artist Sam Kwok takes various Iron Man figures, repaints them, sculpts on elements, and makes some truly spectacular custom pieces. Via Kwok’s Facebook page, you can see the different spin he’s put on the Hot Toys line of Iron Man figures. The detail in the Hot Toys is already incredible, but Kwok puts a creative—an fun—spin on them. The result is something unique and different. If you like these photos, check out more on Kwok’s Facebook page.